A very funny, very inventive movie that really allows will ferrell to show off his talent. This is one of will ferrell’s better movies, and what that really means is it is one of his more creative-driven films. the story here is something different. these two adults still live at home, are still incredibly childish, and are suddenly forced to become brothers. that means we get to see them as both enemies and friends, and both are equally funny. movies about kids trapped in adults bodies aren’t very funny, but this is not that. these two are both adults, they just never really grew up and got jobs are moved out of their parents’ homes. ferrell and john c. reiley are the two driving forces here, with a lot of great reactions from the parents, played by richard jenkins and mary steenbergen. all four of those actors are really bringing it to the table in this movie, going after the laughs, and pulling it off nicely. 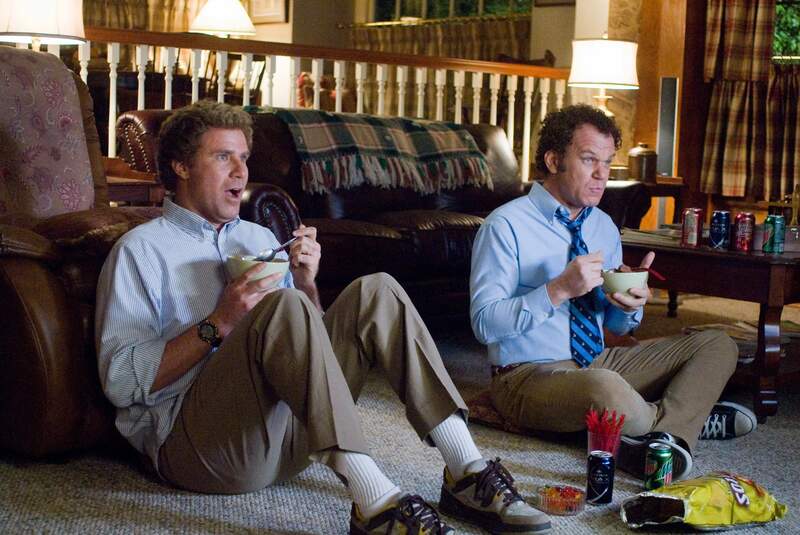 Step Brothers is one of will ferrell’s better movies. he has four really strong movies, and this is definitely one of them. the others are old school, elf, and stranger than fiction. of those four, only elf and Step Brothers are really prime examples of Will Ferrell comedies. old school is an ensemble in which ferrell gets third billing (hardly his movie), and stranger than fiction is a smart black comedy that represents a risk for ferrell (he plays it serious and sad throughout the movie.) 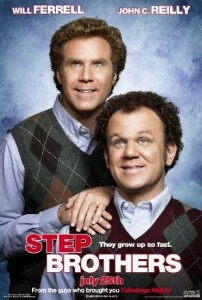 but elf and Step Brothers are the best examples of what ferrell can do, and there’s a reason for that. both movies are extremely creative. Will Ferrell generally makes movies about sports players. from blades of glory (ice skating), to taladega nights (race car driving) to semi-pro (basketball), it often feels like ferrell is making the same movie, again and again. even anchorman, which most people consider the funniest will ferrell movie, felt like it could easily be one of those sports movies. just like those films, where the ferrell character is a major celebrity, doing stupid things, in anchorman, he is too. now that movie is better than all those others, and it is much funnier to watch an idiot read the news to the public, than to watch him play sports, but the creativity was still somewhat missing. in elf and Step Brothers, creativity is behind pretty much every decision. elf, especially, has the character come from a different world, as if he were an alien or something. Step Brothers isn’t quite that envisionary, but it is still pretty cool. the movie is about two thirty eight year olds that both live with their single parents. one day the two parents get together and decide to move in together and get married, and now the two boys are going to be living together as well. only they hate each other at first. the two boys, brennan (ferrell) and dale (john c. reilley), are both idiots. they stare each other down at the dinner table and make mean remarks to each other, as if they are dogs trying to mark off their territory. when dale takes brennan on a tour of the house, his main concern is over his drum set and how brennan is not allowed to to touch it. this, of course, leads to multiple times in the movie when brennan goes and touches the set. in the first half of the movie, the boys go at it with each other over and over again, and it eventually leads to one massive fight. this fight takes place outside on the front lawn and involves weapons. when robert, the father, (played by richard jenkins) arrives home, after being called away from work by his wife (mary stenbergen), to help stop this, he sees the boys wacking each other in the head with baseball bats and golf clubs. they both knock each other unconcious, and when we are back with them, they are seated on the couch, side by side, all bandaged up, ready to hear what their parents have to say. now the first part of the movie is over. the parents tell them that they need to find jobs. aside from that, brennan’s younger and much more successful brother, derek, (played by adam scott) comes to visit with his family. derek is an absolute jerk and treats both of the boys terribly. brennan hates his brother so much that he doesn’t even come to dinner, and dale goes and finds brennan up in a treehouse, and joins him. dale and brenna unite over their dislike of derek, and soon the two of them are becoming best friends. there is a great scene where they ask each other questions that need to be answered on the spot, without any thinking, and both of them shout out the same answers. by the end of the scene they have decided to become friends and to reorganize their room in order to make more space for doing activities. these two are basically like giant kids. the final act of the movie is about both brennan and dale becoming adults. this is less funny than anything else that came before it, but that’s okay, because this is where the movie becomes more about plot than about jokes. for three quarters of the movie, we got some very funny material, including great job interviews and scenes of the boys trying to be successful in business. there is one interview that they go on, where they can’t get the name right of the woman who is interviewing them, even though the name is a very simple one. it is pam. three letters. and their next interview by seth rogen, is nearly as funny. especially when dale has to later explain to his mom why he acted a certain way. Step Brothers is a very funny movie. it’s one of those movies that gets better each time you see it, and is not especially great on a first viewing. that’s because the movie does become more about story than humor as it gets into its later scenes, and as a viewer, we tend to forget a little of how funny the first half of the film was, and even some of the second half. still, the story is good, and so even that final portion of the film is enjoyable, just in a different way. this is a very good movie with will ferrell delivering one of his best performances and john c. reilley matching him every step of the way.